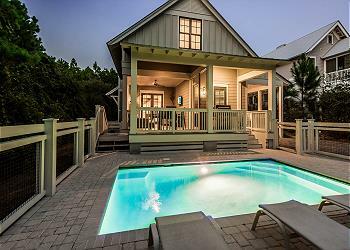 DETAILS: 192 Royal Fern Way is a beautiful, luxury home nestled in the Forest District of WaterColor. This home features 5 bedrooms, 4.5 bathrooms and comfortable accommodations for 12 guests. 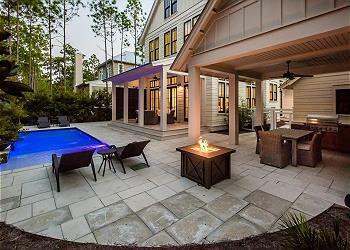 Have fun in the sun on the homes spacious patio, then take a dip into the private pool for hours of entertainment! The first floor of this coastal abode is equipped with an open concept kitchen, living and dining room. The fabulous living space is equipped with posh interiors and plenty of space and seating for the whole family. Guests will find one bedroom located on the first floor, with the remaining four located on the second floor. Enjoy some time with family on the 5 bikes provided exploring WaterColor and its neighboring community Seaside. 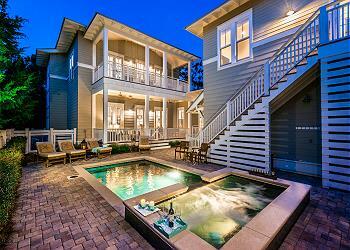 The luxury and convenience of this stunning WaterColor home is sure to impress. Call or book online today! We are so glad that you and your family enjoyed your vacation while here in Watercolor. We agree that this home is perfect for larger families and groups and has something for everyone! We look forward to seeing you again very soon! Great Spring Break for 6 adults & 3 kids under 8. 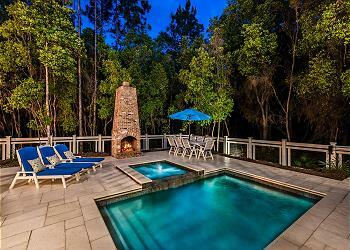 Heated pool, beautiful living area, so convenient to beach & essentials. The 360 crew was very prompt & courteous in answering any questions, locating a box we had shipped, making minor connections on TV. We would definitely rent through them again & would definitely rent this house again. 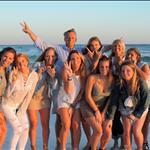 We are so thrilled to hear that you had a great Spring Break with us! The heated pool does feel wonderful this time of year, and we are glad you enjoyed the beautiful living area in the home as well as the convenience of the location. The location does provide easy access to the beach, and plenty of dining and shopping options! Thank you for the kind words about our team; we thrive on giving our guests prompt and courteous service. It was our pleasure to get your needs addressed quickly. We look forward to having you as our guest again! Thank you so much for your feedback. We celebrated Christmas and New Years 2017 in this beautiful home. We had five adults and 3 kids so plenty of space. The house is spacious, well appointed and very clean. The outdoor area is great. We sat on the front porch, kids swam in the heated pool while we sat by the fire pit. We played games and did puzzles at the large dining table. We managed to get in a few beach days even though it was 25 degrees the morning we checked out. 360 Blue did a great job and our concierge Tanner couldn’t have been more accommodating. If you stay here in the fall or winter bring a crock pot and I brought platters based on a previous review which we needed. Other than that the house had everything we needed in the kitchen. It was a great holiday. I hope to return soon. We are so happy you loved this beautiful home as much as we do! It sounds like you had a truly amazing holiday. We look forward to seeing you back soon! Excellent experience!!!! The house was very well appointed, and sufficiently spacious for this group. We had a couple of small service needs which 360Blue handled expeditiously. What a great family photo! We are so happy you enjoyed your stay in WaterColor! Thank you so much for choosing to stay with 360 Blue and be sure to come back and visit us again soon! What a fun and beautiful photo! Looks like you had a great day at the beach making memories! We are thrilled you had such a wonderful first time in WaterColor. Thank you for staying with 360 Blue and be sure to come back and visit us again soon! WOW! We have been coming to Watercolor for 8 years now and it is always our favorite vacation. This year was our daughters last spring break as she heads off to college and will be playing lacrosse, so it was extra special. This house was perfect and even better than the pictures. Number one it is enormous with 14 foot ceilings, wide foyers and living areas, huge bedrooms and bathrooms and a phenomenal pool and outdoor living and cooking area! There were 10 of us and we had extra room and space and never felt crowded. It is beautifully decorated and conveniently located to everything! The only small issue was the lack of serving platters. We cooked dinner almost every night for 10 and had to buy disposable serving platters. Other than that, there is nothing that could have been better. 360 Blue took care of all our needs quickly and kindly from additional bikes to wifi to pool heating. If we come with another large group, I can honestly say for the first time, we will get this house again! What a beautiful family photo! We are so thrilled you enjoyed your vacation! Thank you so much for staying with 360 Blue and we look forward to having you back again soon!